That's a Canadian penny next to the peas. They're tiny, but perfect looking. Here's another example of Mother Nature using a familiar shape of plant and flower. This one – beach peas – grow (where else?) on our beaches. I don’t usually start off with a warning but this time I will. I have found many, many sources that cite historical uses of beach peas as a food source. 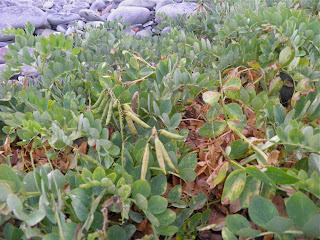 I have also found the seeds of beach peas (grouped in the family of garden “sweet peas”) contain a toxic amino-acid. my spouse and Henry the Bouvier in the waves (top left). This amino acid—in large quantities—can cause a very serious disease of the nervous system known as Lathyrism. I would assume it is present in all members of the genus Lathyrus because the condition’s name is so like the plant name. The seed is said to be perfectly safe and very nutritious in small quantities, but should not comprise more than 30% of the diet. So as another blogger wrote, if you’re marooned on a desert island watch out how much you eat. Beach pea in bloom. It's quite attractive. If you’ve been to a beach in the northern hemisphere anywhere in the world you’ve most likely seen this. 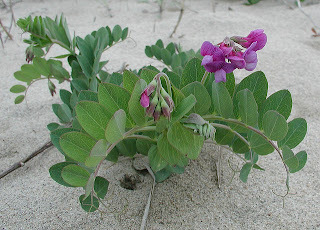 Beach pea is a perennial coastal plant that grows in the sand dunes and gravelly areas of beaches. The species that grows here is “var. maritimus.” There are many others that appear worldwide. 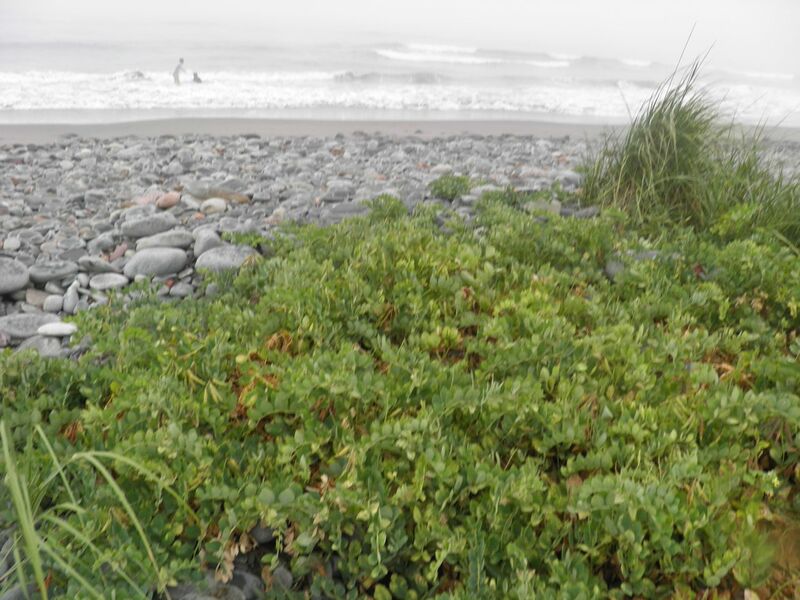 Beach pea looks very much like either vegetable peas and/or garden sweet peas except “hardier.” By that I mean tougher looking, I assume to stand up to coastal conditions. It is hardy to USDA Zone 3. That’s pretty hardy. Bech peas can reach about 2 feet in length. The leaves are oval, arranged in pairs and terminate with a tendril. The flower is a raceme with 5-12 blue-violet flowers. If you’ve ever seen a sweet pea (or vegetable pea) you know what they look like. Flowers appear in July through September in Nova Scotia. The fruit is a typical legume, with 2 halves that split open but remain hinged at the base. Inside you will find pea seeds arranged in a row. 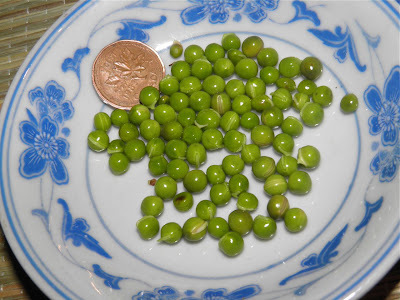 They are quite tiny in relation to vegetable peas. The seeds ripen from late July through to October. If you want to eat the peas you have to pick earlier (when they’re immature) rather than later as they toughen as they mature. If you want to grow it in your garden, you have to let the seeds fully mature. The pea pods, both "pickable" and dried. Beach peas are pollinated by bees and butterflies. 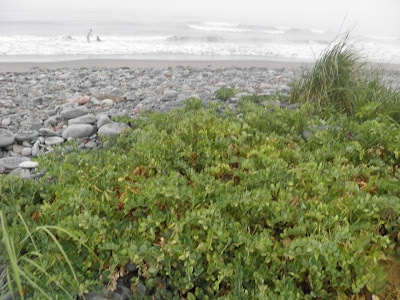 The plants help in fixing nitrogen in the coastal soil. 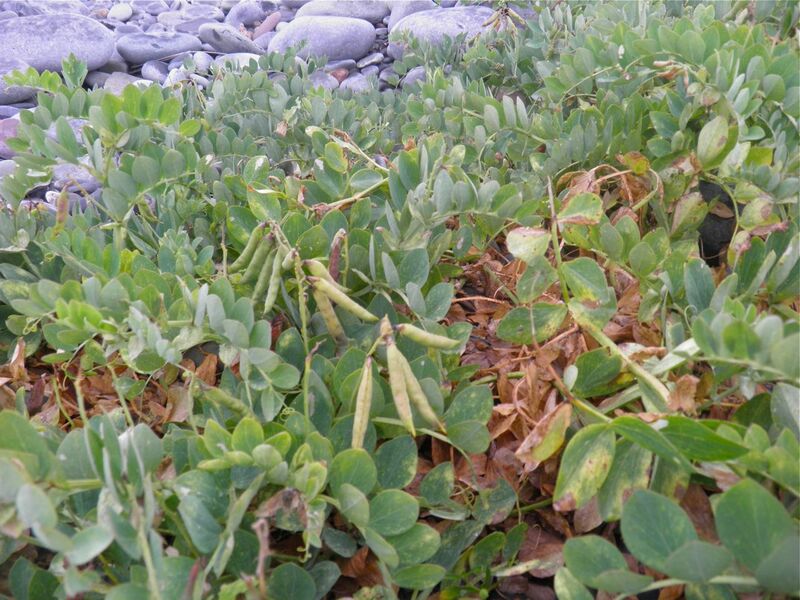 In Canada, beach pea can be found in British Columbia and from Manitoba to Newfoundland. 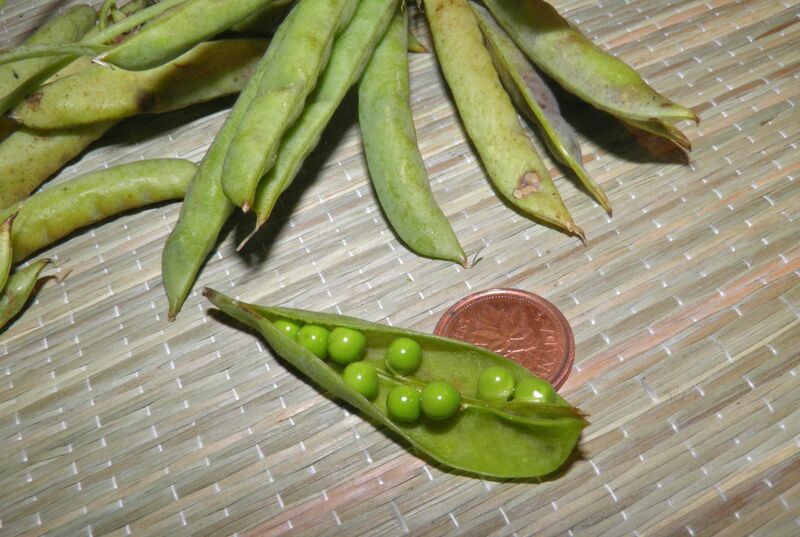 Beach peas can be successfully grown in the garden in well drained soil and full sun. They cannot tolerate shade. The immature peas themselves can be cooked like garden peas. The mature seeds can be sprouted and eaten. The pods can be stir-fried whole and the tendrils can be harvested as a “gourmet” treat. Pea tendrils are quite a fad right now in many gourmet food magazines. They are often tossed in with salads. The Chinese used beach peas as a tonic for the urinary organs and intestinal tract. Iroquois treated rheumatism with cooked whole young plant. Of course, never try to treat yourself with wild edibles.